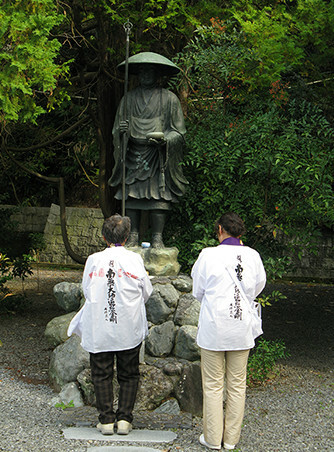 “Ohenro” is the term for the Buddhist pilgrimage around the island of Shikoku, Japan. 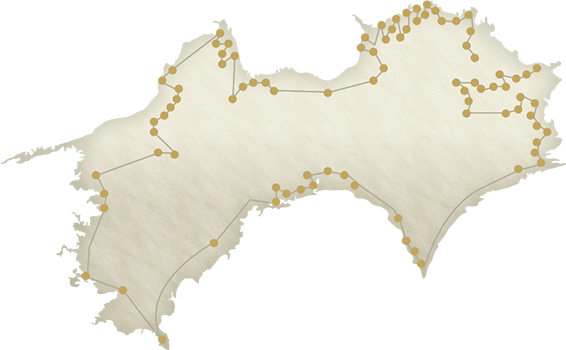 Shikoku (Shikoku, literally “four countries”) is Japan’s fourth largest island southwest of the main island, Honshu. Along with such places as the island of Naoshima, well-known for its art exhibits, and the beautiful parks along the Inland Sea and Pacific Ocean, recently the Shikoku pilgrimage has become a popular travel destination. 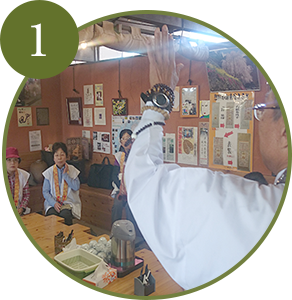 At Anabuki Travel, we offer tours that focus on the ohenro so that people can experience the wonderful aspects of Shikoku. What is most important is not reaching the goal, but the journey itself. The warm hearts of the people you meet and the beautiful nature of Shikoku you see will perfectly complement your action of doing the pilgrimage. 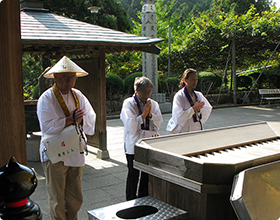 The Shikoku pilgrimage (also called “Ohenro”) consists of eighty-eight “official” temples and numerous other sacred sites located around the island of Shikoku. It is believed that the founder of Shingon Buddhism in Japan, KoboDaishi (Kukai) (774-835) trained or spent time at many of these places, thus he plays a central role in this pilgrimage. Although there are references to people making this pilgrimage from around the 12th Century, it did not become popular among the general public until the first guidebooks were published in the late 17th Century. Today, hundreds of thousands of people from around the world make this pilgrimage by bus, by car, by bicycle, on foot etc. They come for different reasons. Some to remember a relative or friend who has passed away, some to get away from work and responsibilities in regular life, some to enjoy the outdoors, or some to have time to be alone. 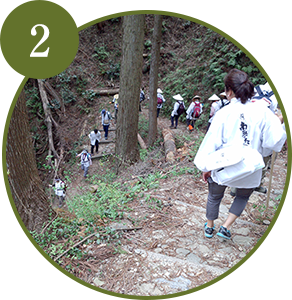 Despite the motive, all people are welcomed along the Shikoku pilgrimage - regardless of nationality, age, gender, social status, religious affiliation, cultural background etc. but it is important to remember that this is a religious journey, not a stamp rally or backpacking trail. The path, sites, objects and people that make up the pilgrimage should be treated with respect. As you follow the footsteps of those who have made the pilgrimage before you, please consider those who come after you. If you are thinking of embarking on some or all of this pilgrimage, do not worry because other pilgrims, temple staff and the local people will support you on your journey. 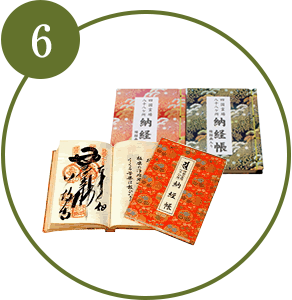 He is one of the most well-known figures in Japanese history and is accredited with many great deeds. Throughout Japan, one often hears his name and one can visit the many places that he is said to have visited during his lifetime. He became the 8th Patriarch of Shingon Buddhism and actively spread the teachings of this new religion in Japan. As well, he is accredited with founding the Shikoku pilgrimage and so, people today believe that this route is a journey which follows his footsteps. However, people also believe that Kobo Daishi accompanies pilgrims as they do the pilgrimage as shown by the phrase, dogyo ninin (same practice, two people). Born into the Saeki clan, a declining aristocratic family, at Temple no. 75, Zentsuji in Kagawa prefecture. Began study of Chinese classics under the direction of his uncle. Entered university in Nara About two years later, he left school, became a monk and spent time as a wandering ascetic. 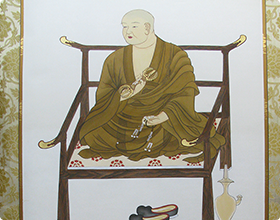 Committed himself to Buddhism and wrote Indications of the Goals of the Three Teachings (SangoShiiki) in which he compares Buddhism with Confucianism and Taoism. He argues for the superiority of Buddhism. It is assumed that he lived as a traveling ascetic. During this time, he might have visited Mt. Koya for the first time as well as have spent time in training at Temple no. 21, Tairyuji and a cave (Mikurado) at Cape Muroto in Shikoku. Left for China with the plan to stay for 20 years to study Esoteric Buddhism. Returned to Japan after have become the 8th Patriarch of Esoteric Buddhism. During his time in China, he studied under the previous Patriarch, Keika (Hui-kuo) at a temple called Shoryuji..
Was allowed to leave Kyushu and come to Kyoto to reside at Takaosanji (later known as Jingoji). He stayed here until 823. Was appointed as an administrative head of todaiji in Nara and acted as such until 813. Received permission from the Emperor to use Mt. Koya. The formal consecration of Mt. Koya. Directed the reconstruction of the Manno-ike reservoir. Moved his Headquarters to Toji Temple in Kyoto. Was officially appointed administrative head in charge of the construction of Toji Temple in Kyoto. Opened the School of Arts and Sciences (Shugei shuchi-in) in Kyoto open to all students, regardless of their social status or economic means. Entered eternal meditation at Mt. Koya. The following steps describe the traditional [but optional] actions Ohenro perform at each temple. First, in front of the gate bow once facing the Main Hall. This is a place to wash one’s hands and mouth, as well as putting on the wagesa and juzu. Rung to mark one’s arrival. Ring the bell upon arrival. It is considered bad luck to ring when leaving. Some temples have limited hours for ringing the bell. Please adhere to such a rule. The main deity can be seen here. First, light incense and a candle. Ring the bell once and declare to the main deity that you have come to worship. 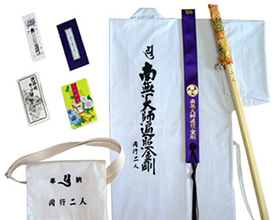 Place the name-slip (osame-fuda) and copied sutra (shakyo) in the box. 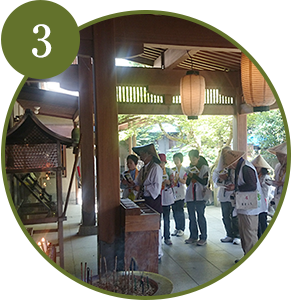 Place a donation in the offertory box, put your hands together and recite the sutras. At the Main Hall, it is common to begin reciting in order the Heart Sutra, then continue with the Gohonzon Shingon and Goho go sutras. However, it is all right to pray silently. Later on, you might start reciting the sutras when you get used to hearing them. In the 5th Century before Buddhism was brought to Japan, a Chinese high priest, Hsuan Chuang, visited India and received the Heart Sutra (Hannya Shingyo) which is used in Japan now. Chuang Selected Chinese characters which have the same sound as the original Sanskrit, so it is said that in Japan, the Hannya Shingyo is an all-encompassing sutra that gives no regard to the religious affiliation of the person reciting it. A figure of Kobo Daishi can be seen here. Face the Main gate and bow once. Ohenro are free to wear whatever they please on their pilgrimage. However, by choosing to don the traditional white vest or jacket and carrying the designated walking stick, you will be identified and respected as a pilgrim by those you meet along the way. Your guide will provide you with all accessories prior to departure. There are as many ways to experience "Ohenro" as there are temples to visit. explain about the different regions and attractions, and work with you to plan the perfect pilgrimage. 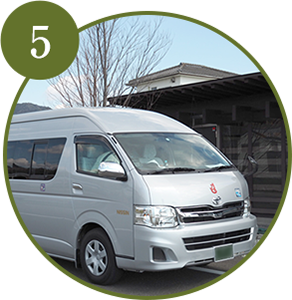 You can travel at ease knowing a professional and authorized Shikoku pilgrimage guide will accompany the tour. It is a highly recommended for those who would like to walk some of the route. 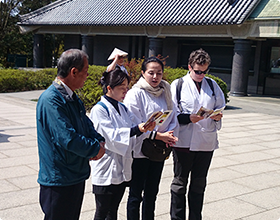 All aspects of making the pilgrimage, such as worshipping at the temple etc, will be taught by the guide. Participants will travel by taxi from one section to the other. If you are not feeling confident about walking on a certain day, it is possible to rest in the taxi. You can keep any excess baggage on the taxi, however, we recommend that you carry wallet etc. with you at all times. You can focus on worshipping at the temple because a staff member will take care of getting the pilgrimage books stamped and signed. 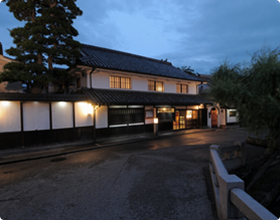 You spend the weekend at Ryokan Kurashiki in a beautiful suite, feeling the history of the place all around you. The meals are wonderful, one at the ryokan, one at a nearby restaurant arranged by Ritsuko-san, the lovely manager. 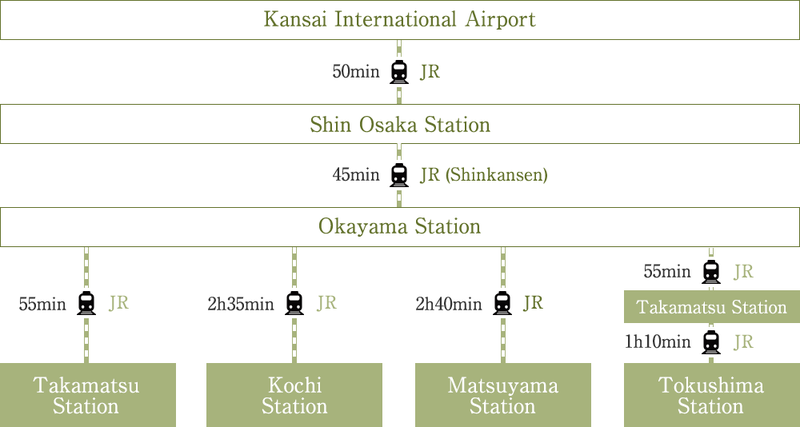 She also arranges for you to visit a local family-run sake brewery and meet a wonderful ceramic artist in addition to a wonderful walking tour of Kurashiki. After a nourishing breakfast it’s time to begin your pilgrimage. 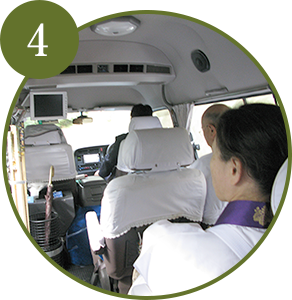 Your personal driver-guide and interpreter pick you up and drive you across the beautiful bridge to Shikoku Island. Your “Ohenro” experience starts with a series of temples located about an hour’s drive from the capital city of Takamatsu. 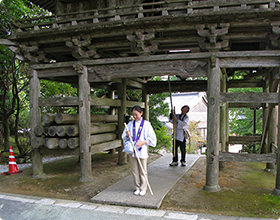 Your guide outfits you with the traditional Ohenro white jacket, walking stick, and neck sash and shows you the bound books you will use to collect the stamps and calligraphy at each temple. As you approach the first temple, Iyadani, he shows you how to bow at the main gate, and then walks you through the suggested steps to be a proper pilgrim. You visit several more temples within walking distance, repeat the gestures and chants at each and enjoy the stroll through the villages and rice fields that separate one from another. You arrive at the final temple, Zentsuji, after 5pm. Of the dozen or so temples you’ll visit over the next few days, Zentsuji is the most important as it’s the birthplace of Kobo Daishi, the monk who originally brought Shingon Buddhism to Japan. That night, you stay at the humble but comfortable Shukubo lodging provided only to pilgrims by the temple. After the luxurious nights in Kurashiki it feels basic indeed, but also entirely authentic as you eat a simple healthy meal in the dining hall surrounded by fellow pilgrims. An early night so you can rise early to join the special morning chanting service with the head abbot and his monks open only to temple guests. After breakfast, you set off to explore several temples in a heavily forested part of the island. 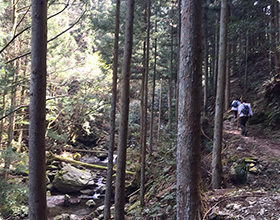 You hike through dense pines and alongside rushing rivers and waterfalls, passing small shrines and Jizo statues, reminding you where you are. The walking is strenuous but never dangerous. You stop for an incredible lunch at a restored farmhouse in what feels like the middle of nowhere. Thoroughly satiated, you welcome the afternoon’s walking and visit several more scenic mountain temples. 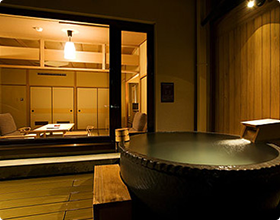 That night, to offset the simplicity of the night before, you stay at the gorgeous Kotohira Kadan, a sprawling ryokan with natural hotsprings and several private “villas.” You’re given the largest in which to stay and it’s incredible. You feel like Japanese royalty, surrounded by a fabulous art collection, a huge private soaking bath, wonderful views, and the most delicious dinner. 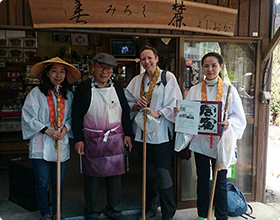 Over the next two days you continue to walk through bucolic scenes, visit temples large and small, and overnight at welcoming and appealing inns, including one with a private Noh theater where you meet the master and learn the history of this mysterious art form. Each day brings new sights, new people, and a deeper understanding of both nature and Buddhism. When the pilgrimage comes to an end, you seriously consider extending your stay... but settle for the promise of a return trip in the future, and the lure of an entirely different pilgrimage in another part of this unforgettable island. your customized Ohenro Pilgrimage experience. and the nearby islands of Naoshima, Teshima, and Shodoshima. 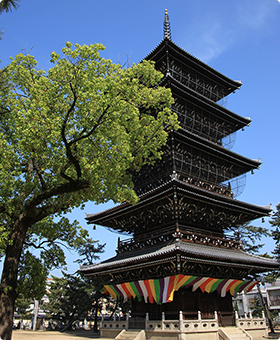 Let us show you the many wonders of Shikoku!